Raid® Earth Options® Automatic Advanced Multi Insect Control System with Natural Pyrethrins is designed for continuous protection against flying and crawling insects. The 305g refill lasts up to 105 days, when used on the 12 hour setting. The 185g refill lasts up to 56 days, when used on the 12 hour setting. For optimal results, keep unit in one consistent location within the home and allow unit to operate continuously without switching off. 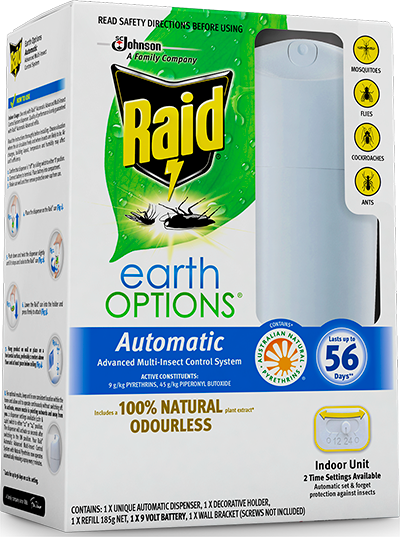 One Raid® Earth Options Automatic Advanced Multi-Insect Control System will serve an average size room (30m3). Ideal for use in homes, offices, shops and other indoor areas.